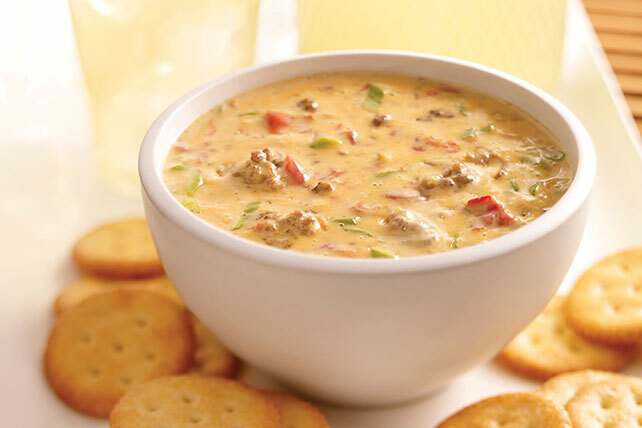 Say 'Aloha' to your new favorite Cheesy Hawaiian Dip! This Cheesy Hawaiian Dip gets its sweet and smoky flavor from ham and crushed pineapple. Cut slice from top of bread loaf; remove center of loaf, leaving 1-inch-thick shell. Cut removed bread into bite-size pieces; cover and set aside for later use. Place bread shell on baking sheet. Bake 8 to 10 min. or until lightly toasted. Cool slightly. Mix VELVEETA, tomatoes and onions in large microwaveable bowl. Microwave on HIGH 5 min. or until VELVEETA is completely melted, stirring after 3 min. Stir in ham and pineapple. Pour into bread shell. Refrigerate any leftover dip. Reheat and use as a cheesy sauce for hot baked potatoes or steamed broccoli florets. Makes 36 servings, 2 Tbsp. each.